On the ride, shortly after you enter the port town, after passing the pirate ship in your ride boat you behold a man being tortured. He is being dropped into a well and hauled back up again to loosen his tongue. Ahead is a bridge and to the left of it animatronic figures act out another vignette. It used to depict a line of women being sold at auction to cries of ‘we wants the redead’ and other catcalls. 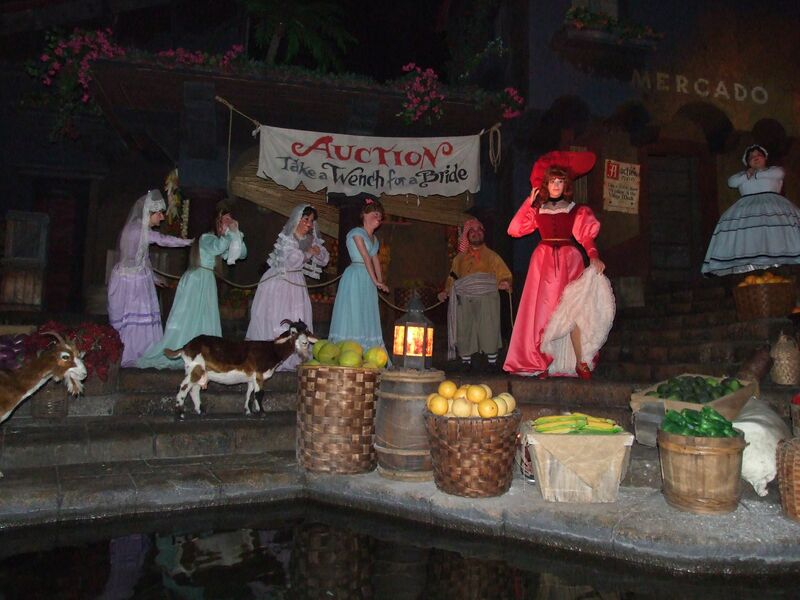 Now it depicts a red-headed female pirate, and the line of people are coming to auction off their goods to the rest of the crew, presumably with little hope of recompense . The original scene in the ride admittedly treated the idea of selling off women lightly, but at least it did show piracy in a dastardly light as a result. 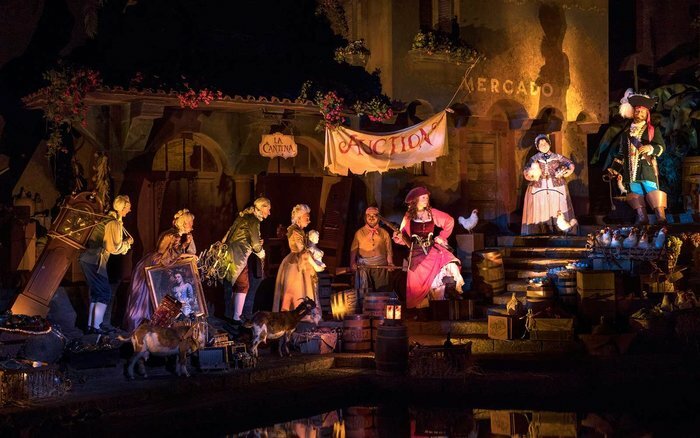 Last year the Walt Disney Corporation’s decision to alter their famous Pirates of the Caribbean rides across their properties struck many as odd if not infuriating. I found it odd, but then I’m a mild cove. I’m late to the show on this subject, but the retooling of the “wife sale” scene in the attraction, which in itself has already seen certain alterations to conform better to popular sentiment and franchise might seem like a back slapping and enlightened thing to do. But at the same time it’s a fairly absurd step back at the same time. Yes girls can be pirates too. But when you get down to it, why is that a good thing? To believe the new concept, WDC thinkers ask you to believe that pirates were essentially inoffensive. The attempt to mould this, to some minds shocking piece of anti female propaganda, into something more wholesome and inclusive at once says it’s wrong to treat women like possessions but it’s totally fine to steal, kill, burn and kidnap so long as guys and girls get to do it equally. Now of course this is not the overt idea behind the ride, which deals with the common perception of old time cinema piracy but there is a reality that always lurks not far away that we should be aware of. Despite what you may have heard Pirates weren’t nice people. The bedrock of most studies of their activities is called ‘The Robberies and Murders of the Most Notorious Pyrates’. It’s called that a reason, robbery and murder kind of went with the territory. Pirates taking the plunder the hard way. In reality they rarely liked a fair fight and the cost for fighting back didn’t bear thinking about. Sure if you grade it on a curve you will find pirates who were less worthy of a rope’s end than others but you are still dealing with a group of people who decided to make a living by stealing things from others. They felt hard done to and therefore entitled and if there’s one thing we’ve all learned in the modern era there’s nothing like being stupidly well armed to make a person feel entitled. Of course just like landlocked criminals the majority tended to filch from large companies rather than individuals, yet the nature of trade in those days meant that livelihoods were indeed ruined by their activities, piracy was never a victimless act. Pirates in the 18th century and before have now and then been quietly defended on the basis of individual circumstances and because people think they were romantic. Like all criminals each pirate had their individual reasons for deciding to follow the black flag, heroes and villains are just people and it’s pointless to drone on about the vicissitudes of the human condition here because the study of piracy is different to the popular perception of it. That being the romanticised, heroic image that most kids get from books and entertainment platforms, where there are good and bad Pirates, or that it was a desirable thing to be a pirate, which when you think about it is really quite messed up. Colin Woodward argued in his book ‘Republic of Pirates’ that these people formed a proto form of democracy. And it is true, they exercised a curious egalitarian sub culture that was quite revolutionary for the time. But let’s not equate these people with, say the founding fathers of the USA, (though some contemporary Britons had some cause to brand every signer of the Declaration of Independence a pirate). Torture, though less theatrical torture, and degrading prisoners in various appalling ways was just a part of a pirate’s life. Pirates did vote on what to do with stolen loot, whatever that loot happened to be, but that’s not quite the democracy of Athens at work. They did recruit ex-slaves to be pirates, and at the same time quite happily sold off the ones that were useless to them. 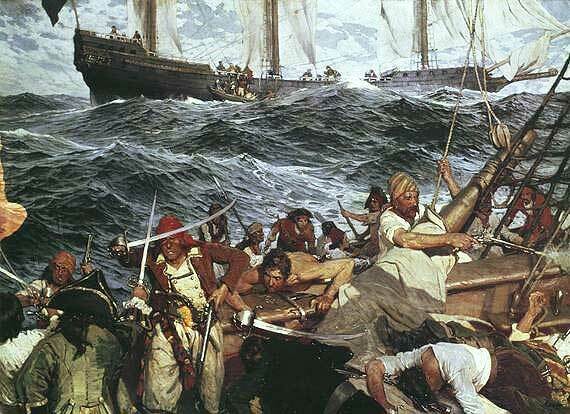 Now and then you find a woman aboard, but more often than not this was taboo on most ships. Let’s not confuse the sort of freedom that the pirates were searching for with the ideals of civilised society. Interesting discussion about what democracy is when utilised ‘by the people against the people’, (essentially ‘might makes right’) in this way and projected against the great capitalist democracies of the early modern era is very interesting but it drags the focus away from what realistically we are celebrating here. The culture of western capitalism is based on taking what you can get and many of us quite enjoy the idea of people stealing, of thieves and master criminals operating by their own rules and pulling off heists against the bad guy. That’s assuming you identify with the criminal of course. Anne Bonny and Mary Reade. 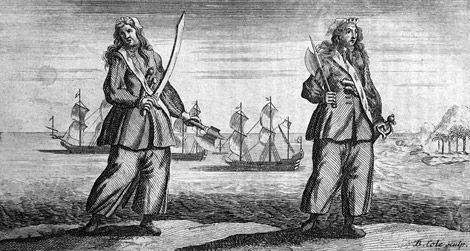 Two famous female pirates, yet it was quite unusual to find western pirate gangs willing to allow women aboard unless to mistreat them. So what about this new part of the popular theme park ride. Personally it’s not so much the revamping of this section of the attraction that is absurd to me, it’s the lame reboot they are giving it. It’s as if the people who did so much to invent the popular perception of piracy don’t get what a pirate is. So what audiences will see now, is not a bunch of villains mistreating innocent women, they will see a bunch of misunderstood renegades talking about chickens and rum. Forget totally there is a guy being half drowned across the street and you just passed a galleon blowing the stuffing out of the fort guarding the harbour. Then to go along with it there is the backlash that bemoans the rise of so-called PC culture, which again misses the point entirely. What is silly about this re-tool is the idea that pirates should be inoffensive. Not only that but this move by WDC all rather flies in the face of those who say we aren’t affected by what we watch, play and read, that images of certain things are strictly taboo, while any amount of lets say violence is deemed quite acceptable. We know that shooting someone in the head is bad but in that case no one says hey, putting this murder in an entertainment format suggests to people they can knock each other off if the circumstances are bad enough. The audience is trusted to understand who the villains are and what is and is not the act of a good person. Pirates believed in private property, but only their own, and generally considered everything else to be up for grabs in a grotesque marketplace where personal possessions were only worth what they could sell or use it for. The objective of all pirates was first and foremost to amass a big enough haul of loot to split up the crew and retire on, and any grand schemes to alter the social order came second to that consideration. So bare in mind who we are defending when we empathise. Specifically speaking allot of these guys went about their business in a pretty nasty way. It’s true that there were some pirate captains who played to a rule book, trying not to mistreat captives and only attacking ships of specific nations etc. Yet let’s not get too carried away here, while it can’t actually be proved that Blackbeard actually murdered anybody with his own hand, the guy was a piece of work. Stede Bonnet was a fairly benign fellow, but that was because until 1716 he was a Major in the Barbados militia with a wife and family who seems to have gone through a mid-life crisis and been one of the first recorded instances of an ordinary man treating piracy as a legitimate life choice based on the legend. He can’t be said to have done much harm, but that was because he was hopeless, a real life Gideon Defoe character but without the humour. His dastardly career was an embarrassment which brought him to the scaffold. Then we might observe men like Sam Bellamy and Bartholomew Roberts, who were what you might have term gentlemen pirates. 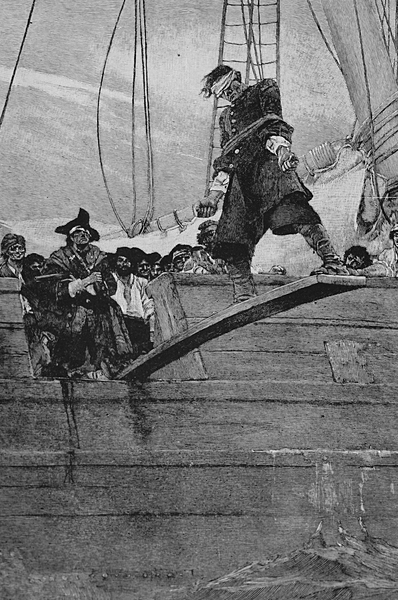 Well Bellamy, even if he was the prince of pirates was still a thief and Roberts had a weird vendetta against anyone from the Bahamas or Martinique. He even painted on his flag a crude portrait of himself standing with one skull under each foot, one labelled ABH, AMH, I’ll let you unravel that riddle for yourselves. He was even rumoured to have hanged the governor of Martinique from a yardarm of his ship. Then there were the more common kind, the simple, cruel, twisted maniacs like Lowe and England and dozens more who aren’t so well known and who tortured, raped, stole, looted and murdered their way through short, brutal and ugly lives that usually ended up with rope necklace, a short drop and before a certain time a long dance. No matter how humane a pirate could be, or how the circumstances of a harsh and unfair social structure shaped them, they still chose to make other people’s lives a misery to even the score and made their living on the misfortune of others, just like any of the big time merchants and bankers they sometimes professed to hate and oppose. So I’ve been quite baffled that people were more concerned about the message that women were being mistreated in this ride rather than being worried about the concept of piracy in itself. Heaven forbid we should slander the good names of those drunken, lecherous, thieving, murdering anarchists by saying, or showing that they were capable of abusing women. In the end, I’m not calling out to restore the ride to its former state in the name of anti PC values, indeed the update has been well done and I’m sure will be very popular. Even though I’d just have included a separate female pirate and left the original scene as it was, there’s no use getting upset about it. But let’s just all please remember when we talk of the messages we send through entertainment; Pirates are the bad guys, they always were, still are and always will be, and we need to grow up and accept that. Previous PostPrevious Book Review: Napoleon, Spirit of the Age by Michael Broers. 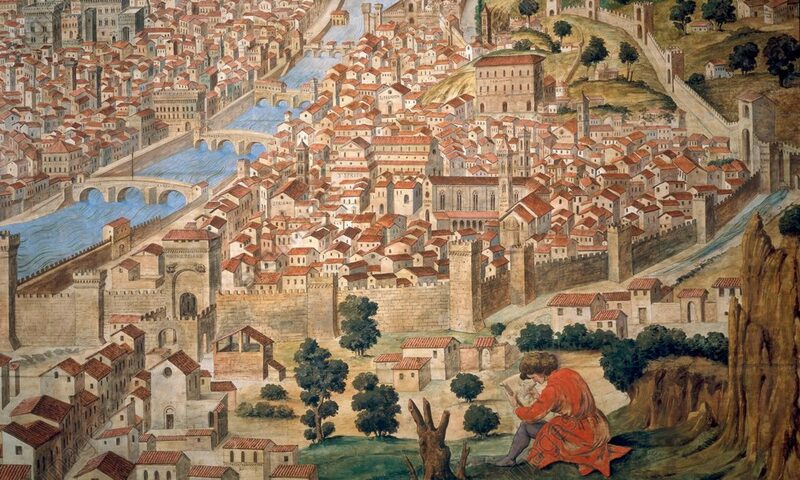 Next PostNext Book Review: Sultans by Jem Duducu.